Hye-Tech Auto delivers outstanding customer service and the highest quality auto repair service in Covina. We'll repair your car, truck or SUV right the first time, performing careful inspections and comprehensive diagnostics to determine the source of the problem before starting repairs or ordering parts. We're a small shop with a big heart, and our 100+ online reviews are a testament to our five-star service. We service all makes and models including BMW and Mercedes Repairs. Don't be fooled into believing your new car must be repaired at a dealership service center to maintain a valid warranty. Federal law dictates that auto service and repair by qualified independent auto shops with certified auto mechanics is sufficient for maintaining your new vehicle warranty, and you're also allowed to use quality parts not from the original equipment manufacturer. Choosing a local, independent auto shop in Covina for your next auto service or repair could save you a significant amount of money over dealership service departments. See for yourself! Call Hye-Tech Auto today at (626) 332-5452 to schedule a FREE auto repair estimate! Brakes are the most important part of your automobile's safety equipment, so it's important to repair them as soon as they begin to show signs of excessive wear. If you hear grinding noises, feel a reduction in braking power, sense shaking or vibrating while braking, or notice your car or truck pulling to one side or the other during braking, get your brakes checked out immediately to avoid an accident or damage to brake components. We service all makes and models including BMW and Mercedes Repairs. 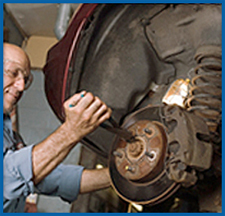 Brake pads and shoes should be replaced before they get a chance to damage the rotors. And even if your rotors are damaged, we can often machine them back to a smooth surface if the damage isn't too severe. But if let go too long, rotors and even expensive calipers must be replaced. For brake pad replacement or complete brake repair at lower, independent shop prices, give us a call. Safe driving and smooth handling depend on a strong and well-serviced suspension system, which is basically everything that connects your wheels to your vehicle. From running over a big pothole or curb to worn parts, a number of things can adversely affect your suspension. In many cases an alignment and tire balance is all that's needed to keep your car from pulling to one side or prematurely wearing your tires, but in some instances shocks and struts need repair or replacement. Our experienced auto mechanics in Covina will inspect your suspension and recommend the best service for your specific needs. 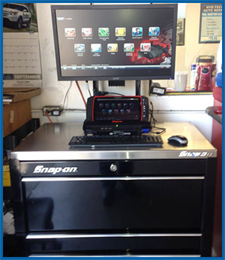 We service all makes and models including BMW and Mercedes Repairs. Hye-Tech Auto is a full-service auto shop in Covina that repairs all makes and models of cars, trucks and SUVs. Our foreign and domestic auto repair technicians expertly perform engine diagnostics, engine rebuilds, transmission overhauls, clutch replacements, fuel pump replacements, starters & alternator replacements, belts replacements and more. For your next auto repair, call Hye-Tech auto at (626) 332-5452 and ask about FREE Check Engine light diagnostics! "John and his staff do an excellent job for me every time. They always take the time to explain the repairs, associated costs, and best course of action based on all considerations."